The Beer Institute reports the Alcohol Tobacco Tax and Trade Bureau (TTB) registered 948 new “permitted breweries” in 2013 and there are now 3,699 active. 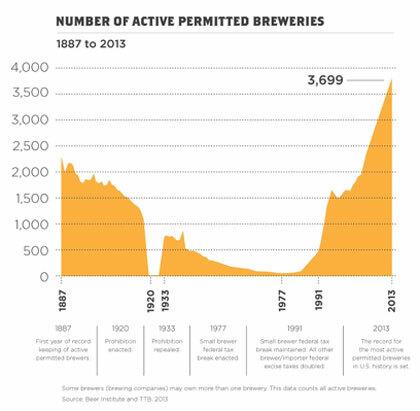 Analysis by the Beer Institute showed that the majority of the new permits issued in 2013 went to brewpubs. It also found four states account for one-third of all breweries in the United States: California, Washington, Colorado and Oregon. “We have tracked the industry since our preceding trade association was first founded in 1862, and there’s a story in these numbers. Beer is constantly evolving in the U.S., with more small brewers than ever before, more brands being introduced by national brewers and growing interest in imports,” Chris Thorne, vice president of communications at the Beer Institute, said for a press release. More than 90% of permitted breweries produce less than 60,000 barrels annually.